The famous line “Diamonds are Forever,” says it well. Diamonds boast the title of the hardest substance on the planet. Over the centuries they’ve also become one of the most valuable and most sought after materials on the planet. Diamonds are nearly indestructible. It’s no wonder then that diamonds are the ultimate symbol of love, commitment, and affection. At Mitchum Jewelers we love diamonds. We continually have some of the finest and rarest diamond jewelry and loose diamonds in the world on display right here in Ozark. We also have strong relationships with several diamond suppliers around the world so we can get you the diamond of your dreams if we don’t already have it in the store. Diamonds have been a source of fascination for centuries. The word “diamond” comes from the Greek word “Adamas”, meaning “Unconquerable”. Diamond is a transparent gem made of carbon, which is one of the Earth’s most common elements. The diamond is the hardest known substance in the world. The diamond is uniquely resistant to damage by heat or scratching, and can only be cut or polished by another diamond. The diamond is thousands of times harder than corundum, the next hardest substance from which rubies and sapphires are formed. Even after many years of constant wear, diamonds will preserve their sharp edges and corners, while most other stones will wear and chip. However, many people expect a diamond to be unbreakable. This is untrue. A diamond’s crystal structure has “hard” and “soft” directions. A blow of sufficient force, in a very exact direction, can crack, chip, split or even shatter a diamond. The first recorded history of the diamond dates back some 3,000 years to India, where it is likely that diamonds were first valued for their ability to reflect light. In those early days, this stone was used in two ways, primarily for decorative purposes, and also as a talisman to ward off evil or provide protection in battle. During the Middle Ages, more attention was paid to the worth of diamonds, rather than the mystical powers surrounding them. Due to the improved public awareness of the value of diamonds, mine owners perpetuated myths that diamonds were poisonous. This was to prevent the mineworkers swallowing the diamonds in an attempt to smuggle them out of the mines. The popularity of diamonds surged during the Middle Ages, with the discovery of many large and famous stones in India, such as the Koh-i-Noor and the Blue Hope. But when the Indian diamond supply dwindled, smaller finds occurred in Borneo and Brazil, but these were not sufficient to meet the ever-increasing demand for diamonds. The mid-nineteenth century discovery of diamonds near the Orange River in South Africa sparked the world’s biggest diamond rush, and helped to satiate the world’s increasing appetite for diamonds. On October 2, 1979, geologists found the Argyle Diamond Pipe near Lake Argyle in Western Australia, the richest diamond deposit in the world. Since then, Argyle has become the world’s largest volume producer of diamonds, and alone is responsible for producing over a third of the world’s diamonds every year. Currently, most diamonds are mined in the following countries: South Africa, Zaire, Russia, Canada, Australia, Botswana, Angola, Namibia, Brazil, Ghana, and China. 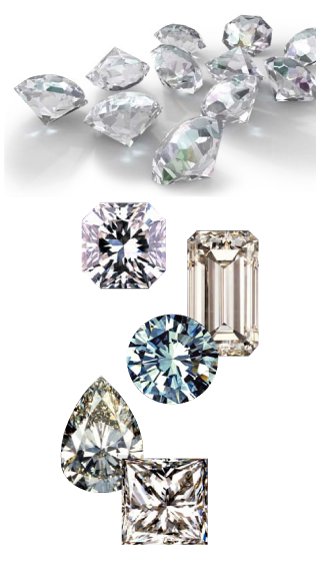 The major cutting centers of the diamond world are in Antwerp, Bombay, Tel Aviv, and New York. The diamond has now become ‘The Symbol of Love’ throughout the world. The tradition of giving diamonds as tokens of love and commitment began at the end of the 15th century when Austrian Archduke Maximilian gave a diamond ring to his fiancée. They chose to place the ring on the fourth finger of the left hand because legend held that this finger provided a direct link between tokens of love and the heart. The diamond’s strength and pure transparent beauty have always represented the purest emotions of human heart — commitment and deep, lasting love. Learn more about diamonds at the Gemological Institute of America. Learn how to buy a diamond at the GIA. Learn about the four “C’s” of diamonds at the GIA.